The #Tattoo Machines were Hot Wheels vehicles that came with a small sheet of temporary tattoos. There were 12 vehicles in this 1993 series and all featured graphics and odd names that matched the tattoos they came with. Take a look >>HERE<< to see what I mean. The BMW 323 had a relatively short run in the Hot Wheels world, only being released from 1990 to 1995. Possibly the most memorable release of the casting came in the 1993 Tattoo Machines line (shown below). Dubbed “Skull Rider” for this release, this BMW featured one of the most polarizing decos. Dressed in metalflake pink paint and wearing #skulls and snakes graphics, the question remains who the Tattoo Machines BMW 323 is suppose to appeal to. 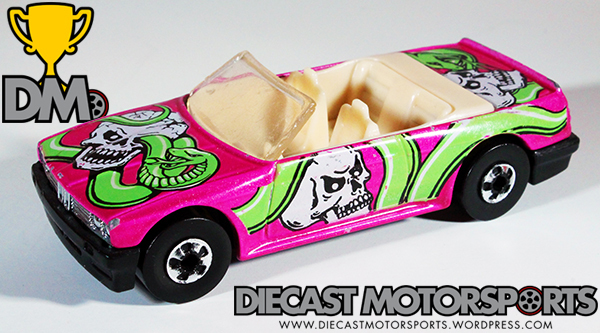 Well, one 10-year-old boy seemed to cherish this pink convertible with skulls and snakes graphics/tattoos. That boy was me. In 1993, Jurassic Park was in the theaters and this car was on the shelf next to my toy bin. Judging by the nicks in the paint and the lack of chrome on the rims, you can tell this car was loved and had seen a few Hot Wheels track set loops. It was something about those fat, mean, blackwall tires that screamed racer to me. So while my collection of cars approaches five digits, these types of priceless gems from my childhood have deep sentimental value to me as they show what 10-year-old me would have driven. You can not argue that this kind of insight is like looking through a window into your past–and for some, that is what collecting is all about! RELEASE DETAILS: Metalflake Pink Body (metal). Clear Windshield. Tan Interior. Chrome Blackwall (BW) Wheels. Black Base (plastic). Made in China. Toy# 3492. Released in 1993 as part of the Tattoo Machines.